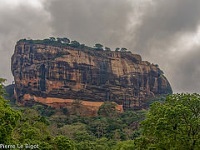 Sigiriya is an important Buddhist site in central Sri Lanka, about 100 miles (161km) northeast of Colombo. The remains of an ancient royal fortress and city dating from 477 AD stand on a vast rock, which rises 600ft (180m) above the surrounding plain. King Kasyapa built it to safeguard against attack from his brother, Mogallana from whom he had stolen the throne after having killed their father. The only way into the city is through the massive carved jaws of a lion - the name Sigiriya is taken from 'giriya', meaning 'jaws and throat' and 'sinha' meaning 'lion'. The site is one of the best-preserved first-millennium city centres in Asia and is also renowned for its 5th-century rock paintings and its magnificent, symmetrical water gardens. Visitors should note that getting to the flat summit and fortress requires climbing about a thousand steps, and it is a good idea to bring plenty of water and to avoid doing the climb at the hottest time of day. There is a museum, outside the main entrance, housing some artefacts from the site, reproductions of some of the art, and photos of the excavation process. Sigiriya is an expensive attraction by Sri Lankan standards, but it is a remarkable and fascinating place and undoubtedly one of the country's greatest historical treasures.